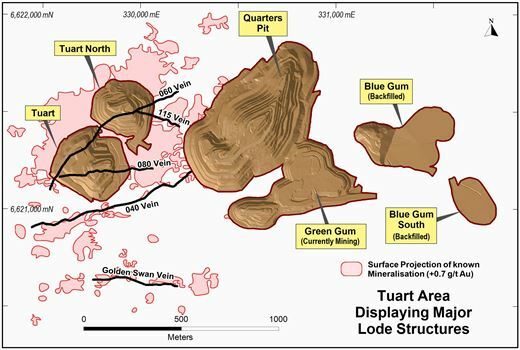 The Tuart Prospect is located within the Mount Pleasant mine camp area, adjacent to the currently operating Homestead underground mine and the previously mined Green Gum open cut mine. The Tuart deposit comprises a series of high grade quartz-carbonate-sulphide brecciated or laminated veins hosted within mafic volcanics. Supergene oxide mineralisation is developed in the regolith immediately above and/or adjacent to the primary veins. Mineralisation covers a broad area located to the northwest of the Homestead underground mine, and immediately west of the historically mined Quarters open pit and underground mine. 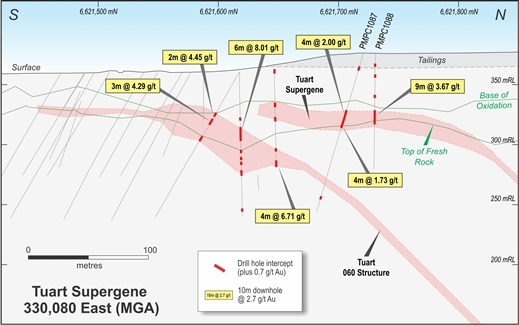 The greater Tuart resource area captures five main primary mineralised veins on varying orientations along with overlying and adjacent supergene oxide mineralisation. The primary veins are labelled the Tuart 060, 115 and 080 Veins, the Quarters 040 Vein, and the Golden Swan 090 Vein. 2017 drilling programs have targeted mineralisation in the hangingwall and foot wall of the Tuart 060 Vein, and the conversion of Inferred Mineral Resource of the Tuart 060 Vein. 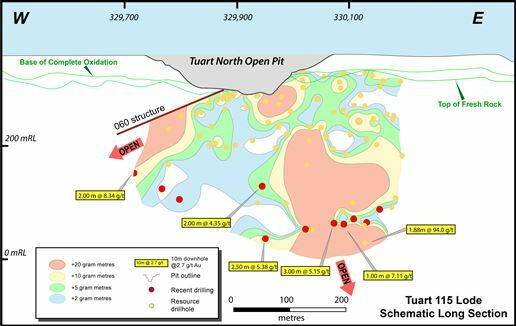 Of note are the encouraging diamond drilling results of the Tuart 060 Vein hangingwall structure intercepts, in relation to the the historic Golden Kilometre underground trend, which provides significant exploration upside. The Tuart 060 Vein and Golden Kilometre trend define a 2km strike of high grade, narrow vein, underground ore potential. As at 31 December 2014 an Indicated and Inferred Mineral Resource estimate of 1.71Mt @ 1.65g/t Au (91,000oz) Open Cut and 2.55Mt @ 5.92g/t Au (485,000oz) Underground has been defined. A Probable Ore Reserve estimate of 0.64Mt @ 1.52g/t Au (31,200oz) has also been defined. Further work, including an underground reserve study, is planned for the Tuart project in 2018.